Some recent studies have concluded that gum disease is actually connected to preterm birth. It might seem odd that something that affects your gums could lead to your baby being born early, but the connection has been scientifically determined to exist. What hasn't been determined, though, is whether treating gum disease after you become pregnant will have any effect on giving birth prematurely. Why Does Gum Disease Factor into Premature Birth? When a woman has any type of infection, it can and often does affect her pregnancy. 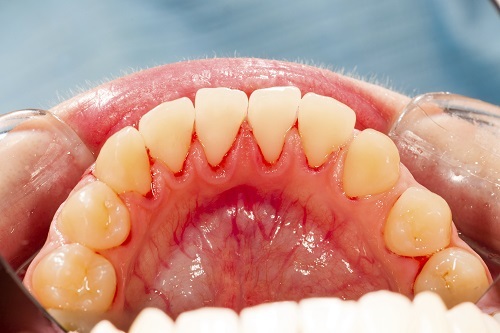 Gum disease is an infection of the gums and mouth, which is why there's a connection. It may not necessarily always lead to premature birth, but it can contribute to having a risky pregnancy if you have a number of other risk factors. Evidence also shows that gum disease causes an immune reaction in the body. This reaction can trigger or contribute to premature birth. The link between gum disease and preterm births has to do with how the bacteria in the gums and teeth move. Over time, if the infection isn't treated, these bacteria are able to get into the bloodstream. From there, they can move into and colonize the fetal membranes. Once they do this, they can start releasing certain endotoxins into the body, leading to inflammation. The mother's body reacts to this inflammation in a number of different ways, including starting contractions. When this happens before the 37th week of the pregnancy, it leads to preterm birth. If you're pregnant or trying to become pregnant, it's important that you come visit us for a full checkup. We will pay very close attention to your gums and let you know if we find any sign of gum disease. We'll then work to eliminate the infection so you can have a happy and healthy pregnancy.